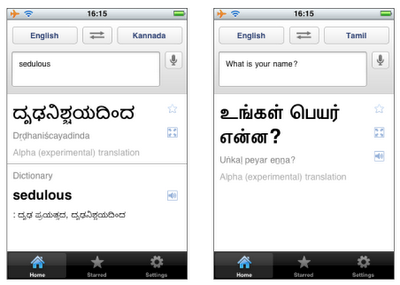 Back in June, we launched five new experimental Indic languages for Google Translate on the desktop and mobile web app. Today, we’ve updated the Google Translate for iPhone app to add these new alpha languages: Bengali, Gujarati, Kannada, Tamil and Telugu. This brings the total number of languages supported by the app to 63 languages. The updated app supports the ability to view dictionary results for single words and to display romanizations for these new Indic languages. So even if you can't read the script the words are written in, you can still take a shot at reading the translation. Since these are still experimental alpha languages, you can expect translations be less fluent and include many more untranslated words than some of our more mature languages—like Spanish or Chinese—which have much more parallel data to power our statistical machine translation approach. Despite these challenges, we believe users will find these new languages helpful and we're excited to be making them available through the Translate app. Google Translate for iPhone now supports text translation among 63 languages, voice input in 17 of those languages, and text-to-speech in 24 of them. Get the latest version of the Google Translate for iPhone app from the App Store now and start breaking down language barriers wherever you are!